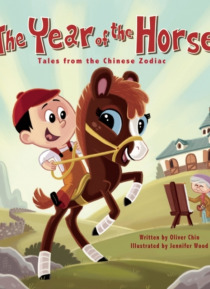 "e;Each [Tale from the Chinese Zodiac] combines a sense of tenacious accomplishment with just plain rollicking fun. Illustrator Jennifer Wood makes sure to imbue every page with energy in motion'dazzling and colorful. '"e;Smithsonian BookDragon2014 is The Year of the Horse! Hannah is a foal who befriends the boy Tom. Together can they bring his art teacher's important painting to the capita… l faraway?Ninth in the popular annual series, this tale features the Chinese lunar calendar's twelve animals and shows how an unbridled spirit can blaze its own trail.Oliver Chin lives in San Francisco, California.Artist Jennifer Wood is an animator at Nickelodeon in Burbank, California.